February 2012 file photo of Camden Hills' boy's basketball coach Jeff Hart watching intensely during a shot at the buzzer. 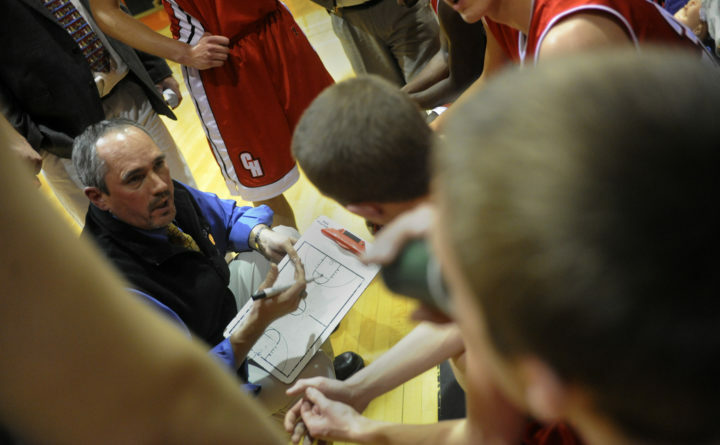 Camden Hills Regional High School boys basketball coach Jeff Hart huddles with his team during a 2009 game at Rockland High School. These are heady times for Jeff Hart. Barely a week ago, the longtime Camden Hills of Rockport boys basketball coach learned he will be inducted into the Maine Basketball Hall of Fame come August. Three nights later, the Windjammers concluded their regular season with an historic 51-38 victory at Morse of Bath — the 500th win of Hart’s 36-year varsity coaching career. “It was quite a week,” he said. Now comes this week, particularly this weekend, when the 58-year-old Hart returns to his coaching comfort zone to guide fifth-ranked Camden Hills (11-7) into a Class A North quarterfinal against No. 4 Cony of Augusta (13-5) at 8 p.m. Saturday at the Augusta Civic Center. “What was the most difficult was that I was pretty adamant that my kids, my players, weren’t going to know about the 500 beforehand,” he said. “It’s not anything I ever talked about it, and I just didn’t want them to think about it and I didn’t want them thinking I was thinking about it. The consistency of that approach has been at the foundation of Hart’s Hall of Fame-level coaching career at Camden-Rockport High School and its replacement, Camden Hills. 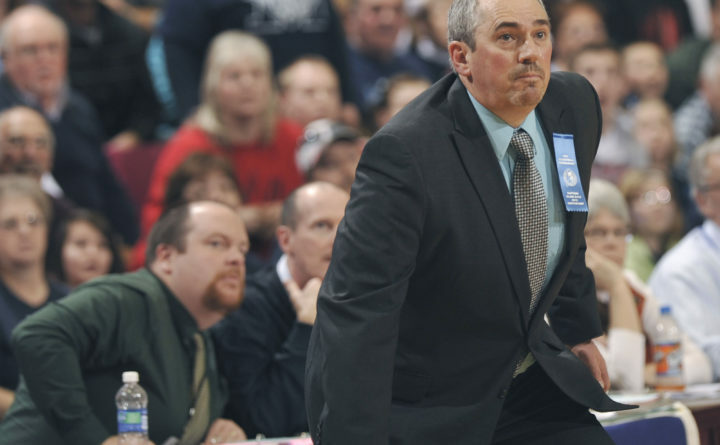 Not only is Hart one of just nine Maine high school basketball coaches with 500 victories, his teams have won six Class B state championships and 10 regional crowns. Yet it took a leap of faith for any of that to happen. Hart is a 1977 graduate of Mt. Blue High School in Farmington where he considered himself a “practice player” under Cougars’ coach Jim Bessey, who also will be inducted into the Maine Basketball of Fame this year. “One reason the Hall of Fame honor is such a thrill for me is because Jim Bessey’s going in with this class,” said Hart. “He gave me such a passion for the game. I’d never seen someone with that much passion for something and how much he loved the game and loved coaching the game. It just rubbed off on me. Hart graduated from the University of Maine in 1981, then spent a year at Ellsworth High School where he coached under the late Bruce Lindberg before facing a decision that would define his path in life. Hart did not have a teaching job when he arrived at Camden-Rockport — he was a substitute teacher the first couple of years before landing a physical education/health job within the district. He also he inherited a basketball program that had gone 15-70 over the previous five seasons. That followed a strong run during the mid-1970s featuring 6-foot-8 center Charlie Wootton, who led the ‘Jammers to the 1974 Class B state title. “They had struggled down here,” recalled Hart. “It was the post-Charlie Wootton era and they were kind of on the bottom but had some pretty good players. I was very fortunate. Hart’s teams posted winning records in each of his first two seasons. “Jeff actually came on the year after I graduated, and we didn’t give him much to work with,” said current Camden Hills athletic administrator Steve Alex. “When I was playing we had an 0-18 season and my senior season I think we went 3-15. Hart instituted a system that featured intense fullcourt defense and fast-paced offense, an exciting style for the fans that also proved popular because it required a lot of players to run effectively. And while Camden-Rockport did not win a tournament game under Hart until 1993, the framework had been established for an unprecedented era of high school basketball on the Midcoast. The Windjammers captured an Eastern Maine Class B championship in 1994, and after winning another regional crown four years later they secured their first gold ball under Hart in 1999 with a team led by Bangor Daily News All-Maine first-team guard Jim Wilson. Additional state championships followed in 2001, 2002, 2005, 2009, and 2011, led by such BDN All-Maine standouts as John Knutson, Tim Stammen, Gordon Fischer, Tyler McFarland and Keegan Pieri. The 2017-18 season marks a renaissance of sorts for Hart and the Windjammers. The tourney appearance will be the first since 2014 and the team’s winning record is the first since the program moved up to Class A for the 2015-16 season under the state’s current five-class format. That the Windjammers are back in contention reflects a return to the basketball normalcy that Hart — also his school’s longest-tenured teacher — has spearheaded at Camden Hills. “(Former Penquis of Milo coach) Tony Hamlin gave me a great compliment the other day, saying that I’m one of the few that have gone through all of the good times and then hung around when I knew we weren’t going to be very good for a couple of years,” said Hart. “I don’t know what made me do it except maybe to prove to myself that I could do it again because I still have a passion for it.